WKU conferred degrees to more than 1,400 graduates and recognized its top students during its Fall 2015 Commencement on Saturday at Diddle Arena. In morning and afternoon ceremonies of its 178th Commencement, WKU conferred degrees and certificates to 1,425 graduates — 65 associate, 981 bachelor’s, 339 master’s, 14 doctoral and 27 certificates. The morning ceremony included graduate and undergraduate degree candidates in the College of Health and Human Services, Gordon Ford College of Business and University College. The afternoon ceremony included graduate and undergraduate degree candidates in the Potter College of Arts & Letters, College of Education and Behavioral Sciences and Ogden College of Science and Engineering. 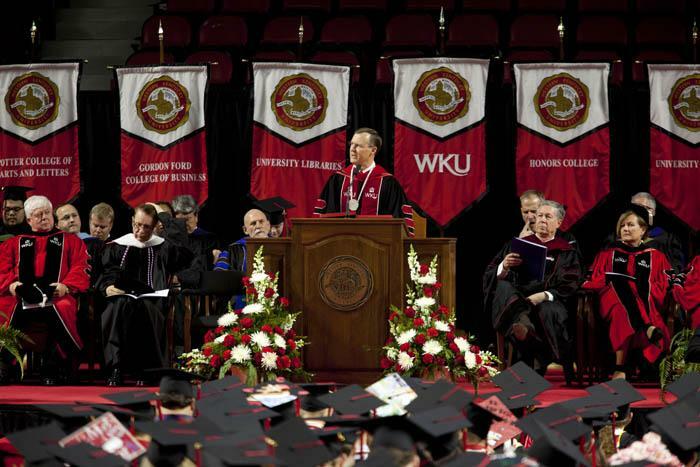 WKU President Gary Ransdell reminded members of the Class of 2015 that commencement isn’t the end of their education. “Your degree is not simply to show the world what you know, but rather to show that you have been educated on how to continue learning. That learning process will be with you forever,” Dr. Ransdell said. “As you leave this beloved Hill, know that leadership matters. It absolutely matters and it is at the core of the WKU Spirit. Do not let anything deter you from exercising the WKU Spirit. It is rare and to be treasured. Jessica Brumley, a Literature and English for Secondary Education major from Lawrenceburg, was recognized as the Ogden Foundation Scholar, WKU’s top academic honor. Brumley is an Honors College graduate and a four-year student in the Chinese Flagship Program. The Ogden Scholar award is presented to one graduating baccalaureate degree senior who has demonstrated exceptional academic achievement and outstanding university and civic engagement. During her four years at WKU, Brumley has completed study abroad trips to China, Taiwan and Cuba and she spent the final month of the fall semester student teaching in Baoding, China. Brumley’s numerous awards include a U.S. Department of State Critical Language Scholarship, WKU Presidential Scholarship, Sigma Tau Delta Study Abroad Scholarship, FUSE grant and Ministry of Education Huayu Mandarin Language Enrichment Scholarship. She also has tutored and mentored elementary and high school students as well as WKU students and has been a member of several campus organizations and clubs. Brumley, the daughter of John and Juliah Brumley, also was recognized as a Scholar of the Potter College of Arts & Letters. WKU recognized 12 other Scholars of the College, who had the highest GPAs in their colleges while completing at least 60 credit hours at WKU. · College of Health and Human Services: Nina Wells of Bowling Green, a Social Work major and Honors College graduate. · Gordon Ford College of Business: Tyler McCulloch of Clay, an Accounting major, Honors College graduate and daughter of Steve and Tabitha McCulloch. · University College: Shelley Owens of Bowling Green, an Interdisciplinary Studies major, Honors College graduate and daughter of Marc and Melanie Owens. · Potter College of Arts & Letters: Hannah Garland of Somerset, an International Affairs and Asian Religions and Cultures major who received concurrent degrees, an Honors College graduate and daughter of Mike and Leisha Garland; Emily Potts of Owensboro, a History, Anthropology and Religious Studies major who received three degrees, an Honors College graduate and daughter of Mark and Terri Potts; Amber Thompson of Bowling Green, an English for Secondary Teachers and Spanish major who received concurrent degrees, an Honors College graduate and daughter of Lowell and Connie Thompson; Jessica Abigail Zibart of Auburn, an Anthropology major and daughter of Philip and Judy Zibart. · Ogden College of Science and Engineering: Andrea Dunnaway of Goodlettsville, Tennessee, an Architectural Science major, wife of Andrew Dunnaway and daughter of Kim Baker; Sidney Greene of Eddyville, a Biology major and daughter of Shannon and Lana Greene; Mandi Martin of Sellersburg, Indiana, a Psychological Sciences major, Honors College graduate and daughter of Kimberly Rosado and Gregory Martin. · College of Education and Behavioral Sciences: Meghan Althauser of Richmond, an Elementary Education major, Honors College graduate and daughter of Scott and Krista Althauser; Elizabeth Sorrels of Cromwell, an Elementary Education major, wife of Quinton Sorrels and daughter of John and Nancy Cox.